Jaffna troops with a beneficiary family. 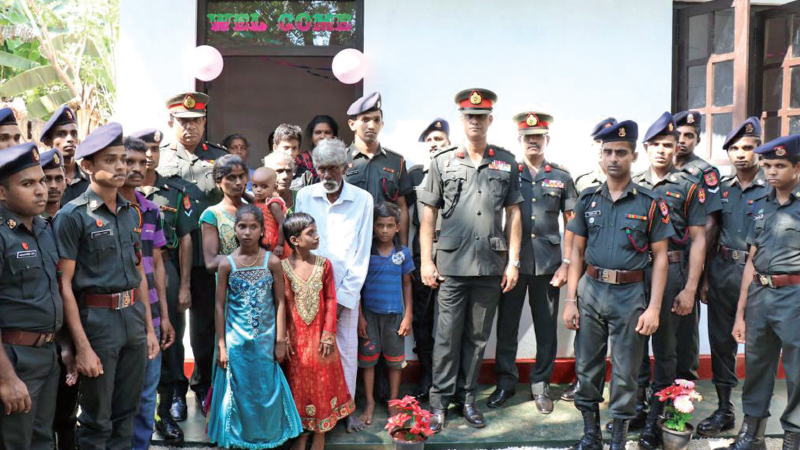 Two newly-constructed houses were provided to underprivileged families at Sollipuram, Jaffna, during a brief ceremony organised by the district’s Army 51 and 52 Divisions, last Sunday. Under the directions Jaffna Security Forces Commander Major General Dharshana Hettiarrachchi, the new houses were constructed with the assistance of the troops from the 14 Gajaba Regiment and 5 Vijayabahu Infantry Regiment, under the 512 and 521 Brigades. Funds for the construction work were provided by the Jaffna Security Forces. The Commanding General Officers of the 51 and 52 Divisions were also present at the event.